Greetings, music lovers! I’m Dean from snuhthing/anything and I was invited to be your guest blogger for the day. You might also know me from Star Maker Machine, the group music blog that both Boyhowdy and I participate in. I was excited by the invitation because it gives me a chance to discuss a song that’s been part of music’s collective memory for hundreds of years, the story the ballad’s based on stretches back to 438 BC with Euripides’ Alkestis. There’s literately hundreds of versions, some titles you might be familar with: The Golden Ball, Maid Saved, By a Lover Saved, Down by the Green Willow Tree, Girl to be Hanged for Stealing a Comb, Hangman Slacken, Ropeman’s Ballad, Hold Your Hands Old Man, Old Rabbit the Voodoo, Mama Did You Bring Any Silver, Freed from the Gallow, among others. 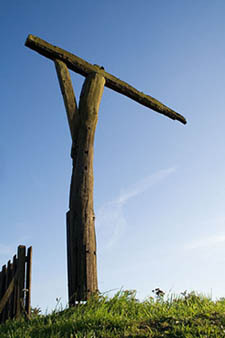 The two we’ll be concentrating on today is Gallows Pole and The Prickly Bush. The Tech Multimedia Music Dictionary defines Folk as “music of the common people that has been passed on by memorization or repetition rather than by writing and has deep roots in its own culture” – Gallows Pole surely fits the bill. The Child Ballads is a good place to start with the modern version of the song, since it found popularity during the 19th century via the collection. One Child number may cover several ballads, which Child considered variants of the same story, although they may differ in many ways (as in “James Hatley”). Conversely, ballads classified separately may contain turns of phrase, and even entire verses, that are identical. The Child Ballads deal with subjects typical to many ballads: romance, supernatural experiences, historical events, morality, riddles, murder, and folk heroes. On one extreme, some recount identifiable historical people, in known events. On the other, some differ from fairy tales solely by their being songs and in verse; some have been recast in prose form as fairy tales. A large part of the collections is about Robin Hood; some are about King Arthur. A few of the ballads are rather bawdy. For a listing of all the Child ballad types, and links to more information on each individual type, see List of the Child Ballads. This brings us to John Jacob Niles, who recorded The Maid Freed From The Gallows (Child Ballad No 95). John Jacob Niles (b. Louisville, Kentucky, April 28, 1892; d. Lexington, Kentucky, March 1, 1980) was an American composer, singer, and collector of traditional ballads. Called the “Dean of American Balladeers”, Niles was an important influence on the American folk music revival of the 1950s and 1960s, with Joan Baez, Burl Ives, and Peter, Paul and Mary, among others, recording his songs. Niles learned music theory from his mother, and began writing down folk music as a teenager. He became a serious student of Appalachian folk music by transcribing traditional songs from oral sources while an itinerant employee of the Burroughs Corporation in eastern Kentucky, from 1910 to 1917. Starting in 1938, he recorded a number of his compositions and transcribed songs, performing the material in an intense, dramatic manner. He employed a trademark very high falsetto to portray female characters, and often accompanied himself on an Appalachian dulcimer, lute, or other plucked stringed instrument. Lead Belly recorded the cover most modern day artists draw from. After a few years, Huddie made it his own. Time to back up a bit and discuss The Prickly Bush variant. The song likely originated in a language other than English. Some fifty versions have been reported in Finland, where it is well known as Lunastettava neito. It is titled Den Bortsålda in Sweden, and Die Losgekaufte in German. A Lithuanian version has the maid asking relatives to ransom her with their best animals or belongings (sword, house, crown, ring etc.). The maiden curses her relatives who refuse to give up their property, and blesses her fiancé, who does ransom her. Francis James Child found the English version “defective and distorted”, in that, in most cases, the narrative rationale had been lost and only the ransoming sequence remained. Numerous European variants explain the reason for the ransom: the heroine has been captured by pirates. Of the texts he prints, one (95F) had “degenerated” into a children’s game, while others had survived as part of a Northern English cante-fable, The Golden Ball (or Key). Child describes additional examples from Färöe, Iceland, Russia, and Slovenia. Several of these feature a man being ransomed by a woman. The theme of delaying one’s execution while awaiting rescue by relatives appears with a similar structure in the classic fairy tale “Bluebeard” by Charles Perrault in 1697 (translated into English in 1729). I’ll never get in any more. Here’s some great versions of The Prickly Bush, a real treat for the ears. I’d be remiss if I didn’t include these fun variants – though I must warn you that In Extremo labels itself a German folk metal band, you might want to turn the volume down. I hope you enjoyed this post as much as I enjoyed writing it. For more information about Gallows Pole and Child Ballad Number 95, I recommend The Prickly Bush/The Prickle-Holly Bush and The Child Ballad Collection. Dean blogs about all genres of music at snuhthing/anything. He is also a regular contributor to blog collaborative Star Maker Machine.